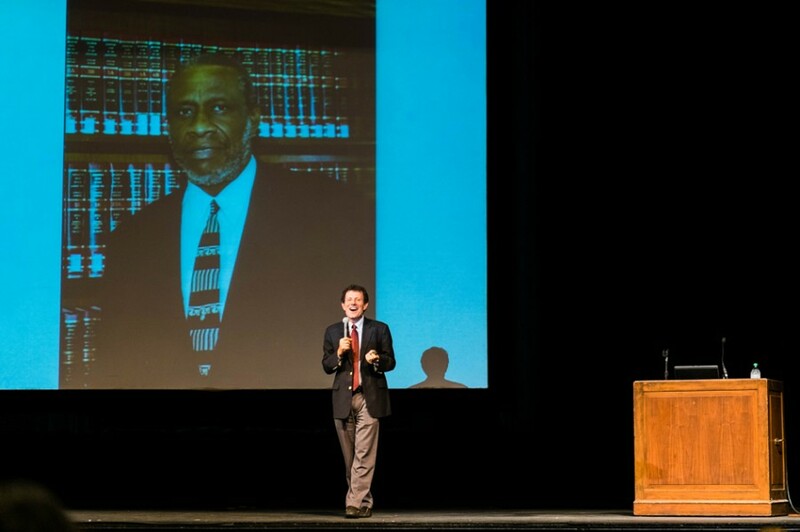 Nicholas Kristof addresses the audience in Cahn Auditorium on Monday night. Kristof shared a variety of personal stories as well as advice for how to make a meaningful difference in global issues. The New York Times columnist Nicholas Kristof spoke at Northwestern on Monday night about ways to create effective global change. After Kristof spoke to more than 500 people, he sat down with reporters from The Daily, Northwestern News Network and NU’s Global Health Blog. The Daily: What global issue are you most concerned about today? Nicholas Kristof: I guess broadly I’m most concerned about the issue of inequality and opportunity, and it just sort of rolls in the question of global poverty, global health, global nutrition and also these domestic issues as well. The Daily: How do you think your column in The New York Times helps to shape public opinion about global issues? Kristof: I don’t think that my columns or in general, newspaper columns, have much impact in changing perspectives on issues that people have thought about. So I think on issues like gun control or abortion or the Middle East, I think we tend not to change people’s views. I think that where we can have some impact is projecting issues onto the agenda, and once issues are on the agenda, then they’re more likely to get addressed. So I hoped that I sometimes help spotlight issues that in a way make them more likely to be addressed. NU Global Health Blog: With the rise in popularity of your column … how do you hold yourself accountable? Kristof: I try to hold my own feet to the fire, and other people are pretty good at holding my feet to the fire as well. The challenge is that there is frankly not vast interest in these issues, and there’s a reason more people don’t cover these issues. They don’t have a huge national constituency. I wrote about Ebola early on, and it didn’t have much impact because it was something that seemed to be happening a long way away. I try to get the facts right, try to have smart things to say, but it’s harden And obviously I’m not an expert on places all over the world, so I do what I can. The Daily: With the way that the journalism industry is changing, what advice would you have for student journalists? Kristof: I think it’s harder for journalists now because they need to have a bigger skill set. I think they need to be very good writers, but I think they also need to know how to shoot stills and video, how to record audio, how to cut video. Fundamentally it’s all about storytelling. I think they need to be masters of storytelling in multiple medias in a way that my generation didn’t have to.